Interests:All kinds of fishing, especially carp! Who Referred you? :Collin, Hairwig, Simon. The forecast called for rain this morning, but when I woke up, things looked pretty dry so I packed the gear into the car and headed down to the north shore of Hammy Harbour to see if anything was doing. I catapulted out a bunch of maize and cast my maize on a hair out among the offerings. I also added a PVA bag of goodies onto my hook, this time. I jammed the bag with a commercial bag mix, plus a little bit of whatever I'm using as a hook bait. I have to believe that in big, open water situations like the harbour, a PVA bag will help the carp zero in on my hook bait, given the wide area of chum that the catapult distributes. Anyhoo, I watched a few carp porpoising on the surface and could only hope they would also be drawn down to my bait in what I estimated was around 15 or 16 feet of water. Although things remained quite for most of the morning, at one point I noticed my rod tip shaking ever so slightly. I wasn't sure if it was the moderate breeze that was responsible so I kept a vigil watch. Sure enough, I saw the rod tip dipped again and, even though it didn't register a bleep on my bite alarm, I knew it was a fish. Sure enough, the bite alarm screamed out a sustained beep, and I was in. The fish gave a good account of itself and I was able to best what, I estimated, was a 10 or 12 pound carp. Any fish is a good fish to me, and I would have been a happy chap with that one fish since it was approaching noon and 'Miller Time," But I re-baited, none the less, and and hoped for one more. Once again, the rod tipped jumped and dipped every so often and I hoped it wouldn't be long for another. After a nice tussle, I was able to bring a slightly larger 14lber to the mat and a nice fellow from the crowd gladly took a photo for me. Than you Sir. "What kind of fish is that?" "Those are garbage fish, aren't they?" Mike, great story and photo. Education is the key. I'm tickled at your response- Hey, it has a mother. 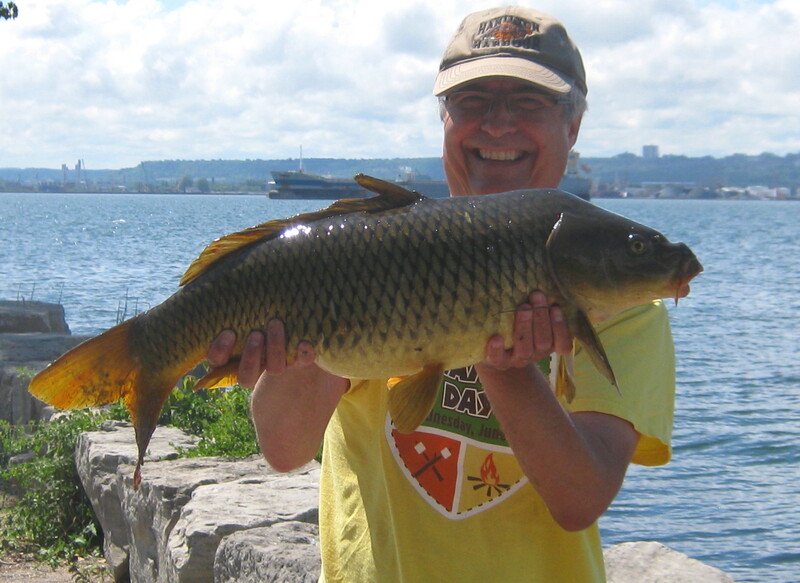 We carpers are very diligent in taking care of our catch. Fin friendly nets, mats., etc. all add up to a positive image. Thanks for sharing.